The High Level Panel on the Post-2015 Development Agenda today released “A New Global Partnership: Eradicate Poverty and Transform Economies through Sustainable Development,” a report which sets out a universal agenda to eradicate extreme poverty from the face of the earth by 2030, and deliver on the promise of sustainable development. The report calls upon the world to rally around a new Global Partnership that offers hope and a role to every person in the world. The Panel was established by United Nations Secretary-General Ban Ki-moon and co-chaired by Indonesian President Susilo Bambang Yudhoyono, Liberian President Ellen Johnson Sirleaf and United Kingdom Prime Minister David Cameron. Andrew Sheng Outlook for Global Development Finance – Excess or Shortage? Oliver Stuenkel Institutionalizing South-South Cooperation: Towards a New Paradigm? “Besides capturing inputs from as many sources as possible, the most remarkable fact of this report is that we, the panelists and co-Chairs alike, were able to rise above national interest and address the Global Partnership and Sustainable Development issues with a true universal perspective”. Leave No One Behind. After 2015 we should move from reducing to ending extreme poverty, in all its forms. We should ensure that no person – regardless of ethnicity, gender, geography, disability, race or other status – is denied basic economic opportunities and human rights. Put Sustainable Development at the Core. We have to integrate the social, economic and environmental dimensions of sustainability. We must act now to slow the alarming pace of climate change and environmental degradation, which pose unprecedented threats to humanity. Transform Economies for Jobs and Inclusive Growth. A profound economic transformation can end extreme poverty and improve livelihoods, by harnessing innovation, technology, and the potential of business. More diversified economies, with equal opportunities for all, can drive social inclusion, especially for young people, and foster sustainable consumption and production patterns. Build Peace and Effective, Open and Accountable Institutions for All. Freedom from conflict and violence is the most fundamental human entitlement, and the essential foundation for building peaceful and prosperous societies. At the same time, people the world over expect their governments to be honest, accountable, and responsive to their needs. We are calling for a fundamental shift – to recognize peace and good governance as a core element of wellbeing, not an optional extra. Forge a New Global Partnership. A new spirit of solidarity, cooperation, and mutual accountability must underpin the post-2015 agenda. This new partnership should be based on a common understanding of our shared humanity, based on mutual respect and mutual benefit. It should be centered around people, including those affected by poverty and exclusion, women, youth, the aged, disabled persons, and indigenous peoples. It should include civil society organizations, multilateral institutions, local and national governments, the scientific and academic community, businesses, and private philanthropy. The report builds upon the historic advances of the Millennium Development Goals. It also harnesses the incredible passion and diversity of voices heard in the Panel’s consultations with people around the globe. The Panel interacted with more than 5,000 civil society groups from 121 countries in developing its recommendations. The report was presented to the United Nations Secretary-General, as an input in the process of consultations being conducted by the U.N. in crafting the development agenda to succeed the Millennium Development Goals following the 2015 deadline for their achievement. 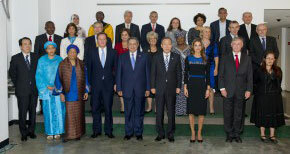 The Secretary-General is expected to present his own vision for the world’s next development agenda to U.N. member states in September 2013. Click here to see the Panel’s framing questions. The strong push for change and evolve homeowner finance is paramount in order to improve the way of life and opportunities for those less fortunate around the world.